Turnover Requirements 1x at odds of 1.50+ within 90 days. PointsBet was launched in early 2017 and it is an Australian betting agency with a difference. PointsBet is the only bookmaker in Australia that offers spread betting, a form of wagering where the size of your win or loss depends on the margin of victory or defeat. This way of betting can be risky, but on the other hand rewards can be massive. We have had a close look at PointsBet and what they have to offer and you will find out everything you need to know about them in our in depth PointsBet review. PointsBet is a relatively new betting company that was launched in early 2017. PointsBet is licensed in the Northern Territory and spread betting is their speciality. You can also place fixed odds wagers with PointsBet so members have the best of both worlds. You can bet on a wide range of sports and PointsBet are approved betting partners of the AFL, FFA, Australia Rugby, Tennis Australia and the NRL. PointsBet are proud of the fact that they offer more markets on NRL and AFL matches than any other bookmaker on the planet. They cover all of the most popular sports and you can also bet on horse racing with PointsBet. Sam Swanell is the CEO of Melbourne based PointsBet and they are 100% Australian owned. Sign up bonus offers are the chief way through which Aussie bookies attract new customers and PointsBet have a very generous sign-up bonus for new customers. They will match your first deposit to the tune of 100% in the form of a bonus bet. The maximum bonus available is $200 but this offer is not available to residents of NSW, VIC, WA and SA. You can find out more about getting your PointsBet sign up bonus via our step by step guide below. Make a first deposit up to a maximum of $200. Your account will instantly be credited with $200 in bonus bets once you place your first bet. You can use your bonus bets on racing or any other qualifying sporting fixed odds event (min odds 1.5). * Other terms and conditions apply see PointsBet site for details. The feature that sets PointsBet apart from the rest is the fact that you can place spread bets with them. This type of betting differs from Fixed Odds wagering as your winnings (or losses) can vary. With spread betting the amount you win or lose depends on the margin by which you bet wins or loses. The payout equals the stake multiplied by the difference between the result and your chosen line or total. PointsBet will temporarily hold an amount greater than your stake from your account until the bet is concluded. This is to make sure that there are sufficient funds in your account to settle the bet in the event of a heavy loss. With PointsBet you can limit your risk level by setting the maximum win and loss (“stop loss”) amounts before you place your wager. If you restrict your minimum loss, your maximum win is also restricted. With spread betting there are no odds. Instead, PointsBet obtain a profit by offering different lines/totals. The gap between the lines or totals is called the “spread”, which is the difference between the “under” and “over” or the difference between the “plus line” and “minus line” on each market. For AFL matches the spread is typically 3 points, while for a low scoring sport like soccer the spread is typically 0.2 goals. You can also place spread bets on the total score, various match statistics and individual performance markets. You can also place bets on “Time Of” markets, where you bet on whether you believe a certain game event or milestone will be reached before or after a specified time. Online in-play betting is not permitted in Australia due to the Interactive Gambling Act. However, most bookmakers still display in-play odds on their websites and you can place in-play wagers by picking up the phone. Unfortunately, PointsBet do not offer live in-play betting of any kind, but they are planning to introduce it in the future. If the situation changes you will find out about it here at Aussiebet first. In Australia betting on the move has increased in popularity in recent years. It is imperative that bookies provide a well designed mobile app or web app for customers who want to place wagers using their mobile devices. PointsBet have mobile apps for Android and Apple devices. If you use an iPod, iPad or iPod Touch you can download the PointsBet App free from the App Store. It is 34.1 MB, iOS 9.0 or later is required and age restrictions apply. The Android App can be downloaded directly from the PointsBet site. For those who use other devices just visit PointsBet and you will be redirected to the web app. 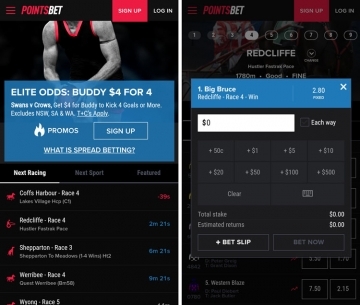 You can bet on racing and sports via the PointsBet App and it is well laid out and easy to navigate. Spread betting is also available on the Mobile and Web App and the odds refresh regularly. The App runs smoothly too, so if you like to bet on the move, then the PointsBet Mobile/Web App is well worth checking out. How Good Are PointsBet Odds? For any punter price is key and it is crucial to find the best odds in order to maximise your profits. The best way to judge the quality of odds is by comparing the margins of bookmakers. We looked at the odds and markets on offer for a recent A-League match between Western Sydney Warriors vs Adelaide Warriors from PointsBet, CrownBet and Unibet Australia. PointsBet had a margin of 105.93% for the match. Unibet Australia had the best margin of 104.14%, while CrownBet were worst of all with a massive margin of 108.77%. However, when it came to the amount of markets on offer PointsBet lagged behind with just 76. Unibet offered 153 extra markets while CrownBet offered 126. So, for quality of odds PointsBet are very competitive, but they could improve by adding more markets. A lot of Aussie bookmakers now offer punters the option of cashing out fixed odds wagers early. Accas and singles can be cashed out before the event you are betting on finishes, but you cannot cash out early with PointsBet. If the situation changes we will update this review to let you know so make sure to keep an eye on our PointsBet review. Although PointsBet focus on spread betting, you can also place bets on the horses. Horse racing is one of the most popular sports in Australia and The Melbourne Cup is known as the race that stops a nation. You can place win, place and each way bets with PointsBet. Best Tote + SP is offered for win betting and Best Tote is offered for place betting. Estimated Tote odds are displayed for each race. Quinella, Exacta, Trifecta and First Four exotics are also available. Instant Deposit Methods: Credit/Debit Card. Non-Instant Deposit Methods: Bank EFT. Unfortunately, PointsBet's customers do not have access to POLi or BPAY, or even PayPal. Until further notice, you can deposit with credit/debit cards and EFT. Before you open an account with a betting agency, you should always check out what banking facilities are available. We weren’t too impressed with the limited banking options available with PointsBet. The only instant deposit method available is by credit/debit card, while bank transfer deposits will appear in your account the next working day. Before you withdraw funds, your account must be verified and you can find out how to verify your SportsBet account below. After you place your first bet or deposits funds PointsBet will supply the Member’s ID to a third party (e.g. Veda Advantage Solutions Group) for the purpose of ID verification. This may involve checking the Member’s ID against third party databases and/or credit headers. Unfortunately, the verification process available is not perfect and PointsBet cannot verify 100% of our Members this way. PointsBet may also use other public information services to confirm a Members’ identity. Maximum payout on any bet: $50k. Maximum payout on ITF Tennis: Match betting: $3k. All other markets: $1k. Maximum dividend for Multis: $1001.0. *Please check PointsBet Terms and Conditions other limits may apply. Providing quality customer service should be the aim of any company no matter what the industry. PointsBet pride themselves on putting the customer first and there are a number of ways you can get in touch with PointsBet. You can check out their contact details below. Post: PointsBet, PO BOX 4191 535 Richmond East 3121. Live chat: Available 24 hours 7 days. 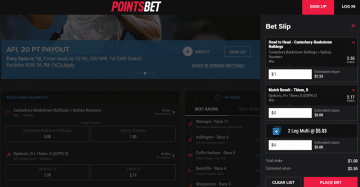 Is PointsBet A Bookmaker You Can Trust? Another key factor that you need to think about when opening an account with an online bookmaker is can they be trusted. You have to part with personal information and banking details, so for peace of mind it is good to know that your info is kept safe. PointsBet have put a number of procedures in place to protect your personal data and we list some of the key security measures below. All personal details are stored on a secure server. Data is protected using password protected systems and databases. The latest Secure Socket Layer (“SSL”) technology is also used to protect information. PointsBet’s employees, agents and contractors are required to maintain the confidentiality of Members’ Personal Information and trading behavior. Gambling should always be something you enjoy and if you are worried that you are gambling too much PointsBet have plenty of resources for problem gamblers. Here at Aussiebet we are keen on the promotion of responsible gambling and we are glad to report that PointsBet hold the same view. 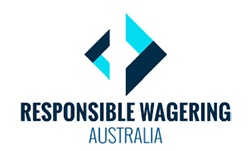 Below are some of the procedures PointsBet have put in place to promote responsible gambling. Customers can set a deposit limit. Customers can self-exclude (either temporarily or permanently). Provide Responsible Gambling information and messages to customers. Train staff about Responsible Gambling. Refer customers who are at risk of problem gambling to gambling-related support services. Overall, the main thing that sets PointsBet apart from the rest of their competitors is spread betting. 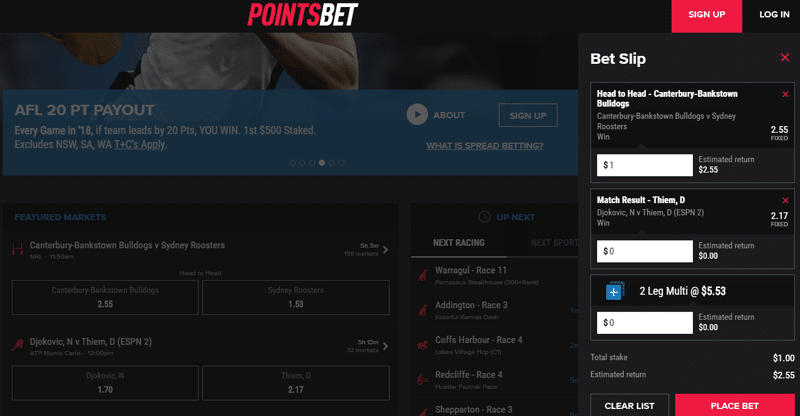 They are currently the only Aussie bookie offering that service and if you fancy giving spread betting a try then PointsBet is well worth checking out. Limited banking facilities and the lack of a cash out option are obvious negatives, but the NRL and footy specials are excellent and the mobile and web apps are another feature. The fixed odds on offer are more than decent too, and you could do a lot worse than open an account with 100% Aussie owned PointsBet.